Are Human Strain Probiotics superior? Yes, they are. It actually refers to probiotic strains that are recognised by the human body and therefore compatible with the human body. Inspite of the name, “human-strain” probiotics don’t actually involve humans or human byproducts as ingredients. They’re just a particular species of microorganisms that naturally (or exclusively) live in nature as well as in the human already. Recent Human Microbiome Project research done by NIH, the National Institute for Health, has defined probiotics by strict criteria. We see lots of references on line that quote the ‘old’ definition. They are not correct and out of date. 3. The organism must be able to survive in the digestive tract as well as in the environment. i.e. not be affected by stomach acid and bile. Interestingly enough there are very few probiotics in the marketplace today that meet all three of these criteria! Most probiotics available on the market today contain Lactobacillus and Bifidobacteria species. According to the new probiotic criteria, they do meet the first requirement defined by NIH research. They do naturally occur in the digestive tract. In fact, Lactobacillus and Bifidobacteria species are in very high concentrations in the digestive tract of humans. But that is precisely why these two bacteria don’t meet criteria #2. There are more that 20 trillion lactobacillus and bifidobacteria species in the average human digestive tract. Most probiotics on the shelf contain 100 – 200 billion strains. This is not nearly the amount that would result in long term benefit. This also assumes that the bacteria survive the digestive tract. Research shows that a majority of orally supplemented lactobacillus and bifidobacteria species are destroyed by the conditions found in the stomach and upper digestive tract. Only few survive. Another important factor is that lactobacillus and bifidobacteria are anaerobic organisms that are designed to live in the digestive tract. They don’t normally live in the environment because they are sensitive to the presence of oxygen, UV light and other chemicals found in the natural environment. This means they do not fit #3 requirement of our new definition of probiotics either. In actual fact, people get their initial dose of lactobacillus and bifidobacteria from their mothers through birth and breast feeding. Later in life, it’s necessary for orally derived probiotics to be organisms that live naturally in the environment as well as in the digestive system so that they can be recognized by the human microbiota. In light of this information, yogurts and yogurt based drinks like kefir, don’t work as probiotics. They do have benefits but that’s from the fermentation process and those benefits are contained in the product in the form of micro-nutrients. But those strains used in yogurts and other fermented dairy products, don’t have the ability to survive the harsh stomach acids and actually don’t colonize in the GI. For a true probiotic, we need one that will survive the stomach acid. We need human strain probiotics. What we refer to as human strain probiotics are ones that are found in nature in the identical form as they are found in the human body. They are known as commensal organisms. They can’t be used to grow yogurt. They have to be harvested from nature. The strains we recommend are bacillus strains that are contained in endospores. Nature has designed these spores to be daily, foundational food. They are transient microorganisms, so they don’t stay in the gut forever. They go in, they perform their function and than they leave. This is important factor, as this helps to keep their numbers in the digestive tract relatively low and that’s why each does is relatively low. FYI – It usually takes about 21 days to reach a steady state of concentration in the gut when they are taken on a daily basis. We suggest eating a diet low that is low in refined sugars and higher in fibers so that we encourage our own good bacteria to grow. In fact, the spores are able to increase the growth of the good bacteria present in the gut as well. Between the spores being present and an improved diet, we are able to create the right microbiota balance. If the spores are removed, then we are disturbing the balance that may lead to what we call ‘Dysbiosis‘. 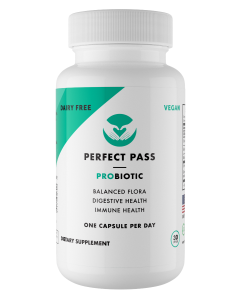 This is why we recommend taking Perfect Pass Bacillus Spore Probiotics on a daily basis as it’s important to maintaining good bacteria balance. We constantly bombard our digestive system on a daily basis. The bacillus spores are great at monitoring our gut and keeping it in balance.